Home / Stock Picks / Hot Stocks / Is Advanced Micro Devices (AMD) a Buy After Earnings Plunge? Is Advanced Micro Devices (AMD) a Buy After Earnings Plunge? 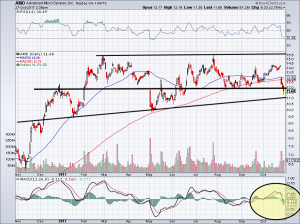 Everything was going well for Advanced Micro Devices, Inc. (NASDAQ:AMD). Then came AMD earnings. Despite beating on earnings and revenue estimates, the stock took a plunge and is now down 17.5% over the last four trading sessions. Do investors double down or throw in the towel? So what caused the selloff anyway? The company had some negative commentary in a few of its businesses. It said graphic chip demand for cryptocurrency demand was leveling off, as was demand behind blockchain. However, it’s hard to believe AMD’s take on blockchain, given all the good news we’ve heard from banks and especially International Business Machines Corp. (NYSE:IBM). Then the company guided for revenue to decline 13% to 18% sequentially (from Q3 to Q4). That broke a six-quarter streak of quarter-on-quarter (QoQ) revenue growth. Some of the momentum may be waning, but is that really cause for selling AMD stock? Some say yes. But let’s not overlook the fact that despite the company guiding for a QoQ drop in revenue, the midpoint still came in ahead of consensus expectations. Further, the company increased its full-year revenue growth forecasts from mid- to high-teens, to above 20%. That’s great news and more important than any QoQ action. For the longer term, AMD stock still looks fine. But there is an issue and it’s not really the fault of Advanced Micro. The simple fact is AMD is going up against two incredible titans in Nvidia Corporation (NASDAQ:NVDA) and Intel Corporation (NASDAQ:INTC). Can you imagine having to compete with them? Thankfully, AMD is in some great industries, but the sledding is certainly tough. There’s resistance up near $15.50 on the chart, but that’s not something we need to worry about right now. Currently the stock finds itself free-falling into no man’s land. Below the 200-day and 50-day moving average isn’t good and previous $12 support has gone out the window. AMD stock is near oversold, which has occurred a few other times this year. Each led to a great rebound in the short-term. That’s not a guarantee that it will play out this way again, though. The issue, really, is that there’s no notable support nearby. Investors can bank on the fact that Advanced Micro trades at a lower sales-based valuation than INTC or NVDA. Or that management continues to grow sales at a healthy clip, is bolstering cash and reducing debt. Net income is on the right path too. There are positive developments going on with Advanced Micro and its long-term outlook remains bright. So I won’t fault long-term investors in lowering their cost basis on the latest decline. After all, shares are down 25% from the highs made in the summer. But as far as trading AMD stock goes, finding a positive is tough. Momentum is negative and support is gone. $12 was a big level. 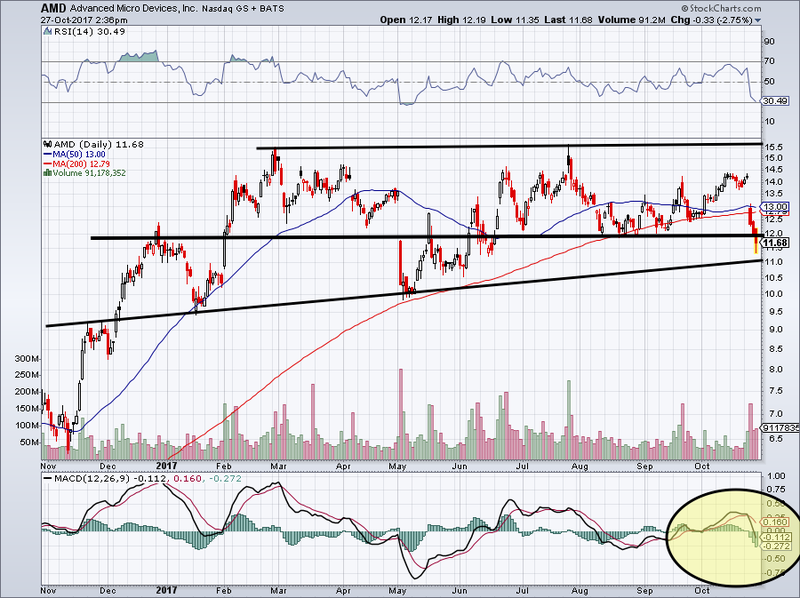 If AMD can reclaim $12, short-term bulls can take a long position and use the recent low as their stop-loss. Or they can buy on a pullback to $11. The sky is not falling and the world is not ending for Advanced Micro. AMD earnings could have been better and management could have been more upbeat. Heading into the seasonally strong fourth quarter, investors were wanting something to cheer about. Intel’s better-than-expected results and guidance boost is the right blueprint. Nvidia will hopefully be positive next month as well. As far as AMD stock goes though, its shares are paying the price for disappointing the Street. But as I noted, in the longer term, AMD should be fine. Business is going well and it’s positioned in excellent growth markets. But right now, the stock is in no man’s land. Plus, with the momentum in stocks like Micron Technology, Inc. (NASDAQ:MU), Square Inc (NYSE:SQ), NVDA, Amazon.com, Inc. (NASDAQ:AMZN), INTC, Apple Inc. (NASDAQ:AAPL) and others, who would want to bottom fish on a dud like AMD? Let’s also not forget that AMD stock is still up 64% over the past year and more than 425% over the past two. 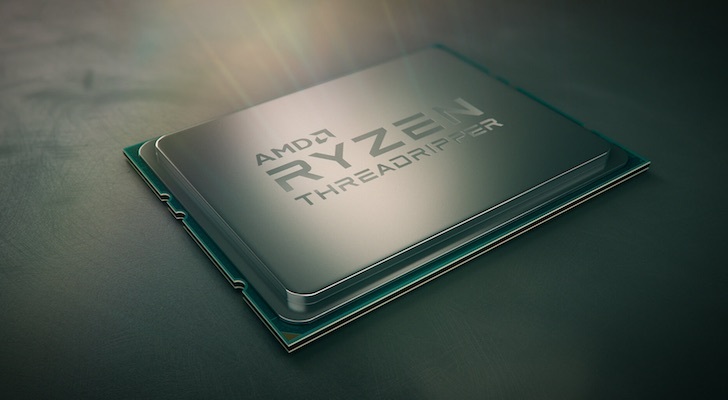 AMD will be fine, but it has some rust to shake off first. Article printed from InvestorPlace Media, https://investorplace.com/2017/10/amd-a-buy-after-earnings-plunge/.